The Eritreans dying to reach Europe aren’t looking for jobs. They’re fleeing a nightmare. 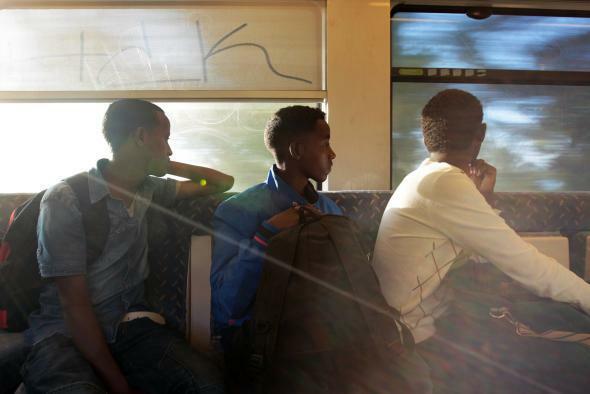 Three young men from Eritrea cross the border between Italy and France on board a regional train last year near Nice. The U.N. Human Rights Council released a disturbing report on abuses by the Eritrean government yesterday. Mark Leon Goldberg sums up some of the reports’ more outrageous findings about the East African dictatorship’s practices, including the training of children to act as spies for the regime, an extortive “coupon system” that maintains government control over nearly every aspect of daily life, and the widespread use of gruesome torture methods against prisoners. “The commission finds that the use of torture is so widespread that it can only conclude it is a policy of the Government to encourage its use for the punishment of individuals perceived as opponents to its rule,” the report states. Isaias Afwerki’s government also maintains a conscription system for government service that forces citizens as young as 15 into servitude that can be extended indefinitely. Taken together the policies are designed, according to the commission, to keep the population in a state of permanent anxiety. “It is not law that rules Eritreans—but fear,” the report concludes. Eritrea is a small and isolated country; conditions in the “North Korea of Africa” probably would not have attracted much attention if they weren’t a major driver of the worst migrant crisis facing Europe in decades. Eritreans account for about a quarter of the migrants trying to reach Europe and are the second-largest group by nation, after Syrians. More than 300,000 people have fled the country since 2000 and 4,000 leave each month—incredible numbers for a country of just 6 million people, despite the government’s shoot-to-kill policy at border crossings. With the number of those making the perilous crossing regularly breaking records, and European government struggling to craft a unified response, it’s worth remembering what exactly is driving the exodus.